The final leg of our epic 12-day, 6-state, Japan adventure took us to Tokyo. The Tokyo leg of our trip is the most laid back leg. We planned not to do too much then and just go shopping and eating. 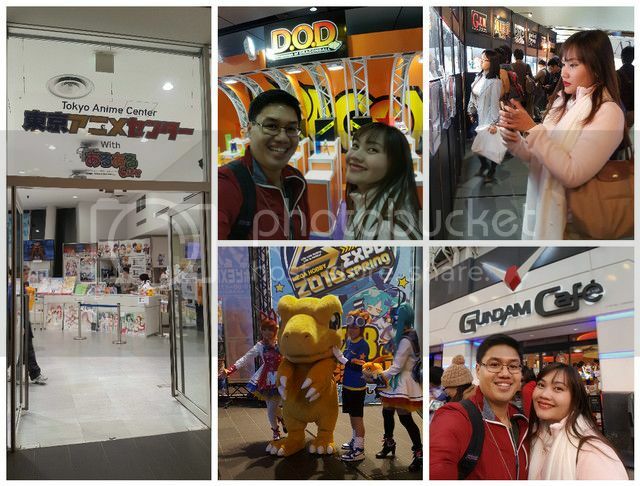 Apart from Tokyo Disneyland, our itinerary consisted of just random tours to areas that interested us. 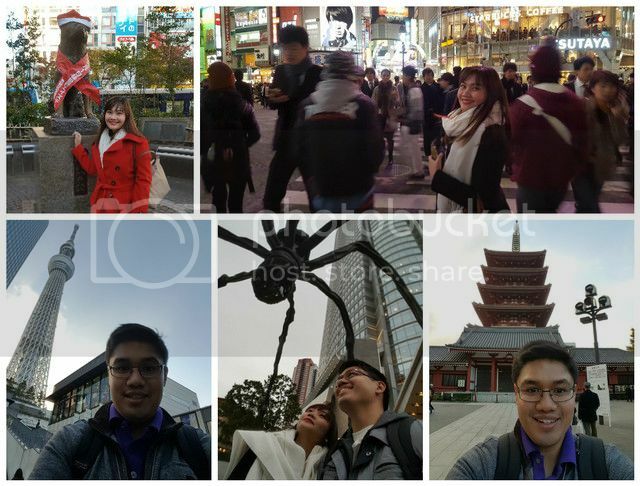 We didn't spend so much time at the tourist spots in Tokyo. We merely passed by them, took a picture and went on our way. 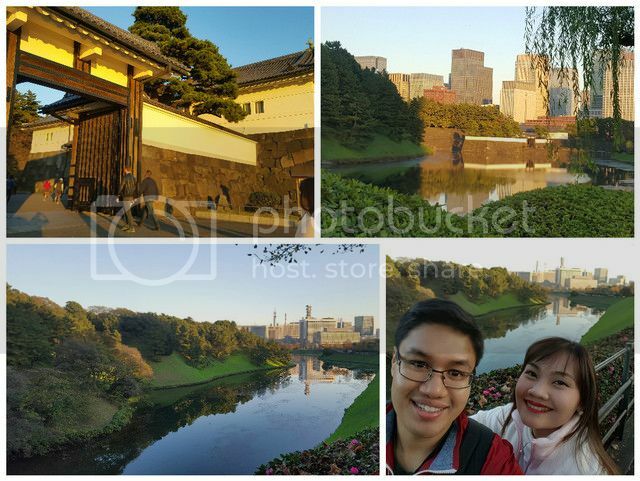 I guess we did a sort of "essential Tokyo" itinerary. Just because we were in Tokyo and we should go see those places. 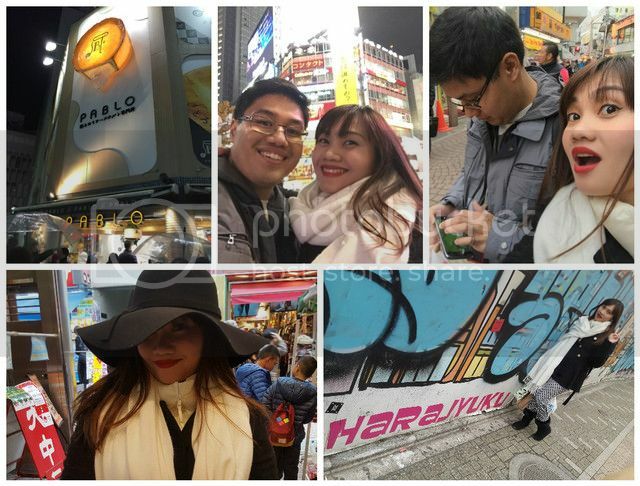 We went to Harajuku primarily to shop! It was our last full day in Tokyo and we had to buy pasalubong for all our relatives and friends (more on our shopping trip in our next posts!). We waited till the last day because we went around Japan via trains and we lugged our luggage with us all the time. Thankfully, EJ was with me and helped me carry them especially in stations with elevators. Yes, we went to Pablo's cheesecake (top left), home of the gooey raw cheese cake! And it is VERY good! Tokyo is so modern and cosmopolitan, and yet it was very quiet. The people there didn't talk in stations or even loudly inside restaurants. There were a lot of people and you would think it would be chaotic but surprisingly, it wasn't. No one was talking, just a lot of people walking. They do seem like robots sometimes because of it. It was definitely an interesting aspect of the city. 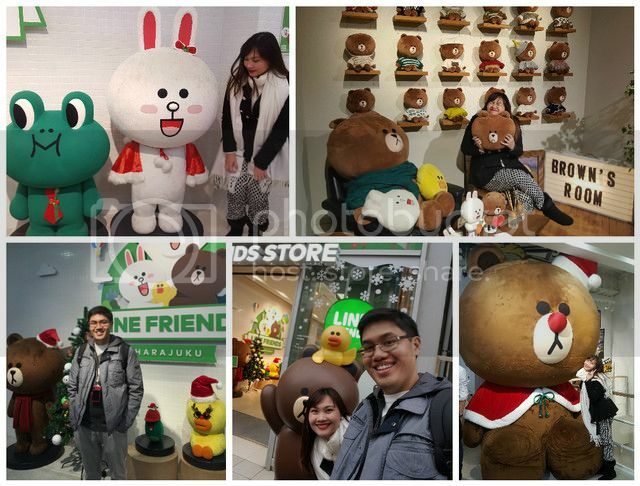 We dropped by the Line store too because Line is the main messaging app we use to communicate. We actually use a lot of other apps like viber, imo, whatsapp, and FB messenger but we use Line the most often because we find the stickers and emojis really really cute! 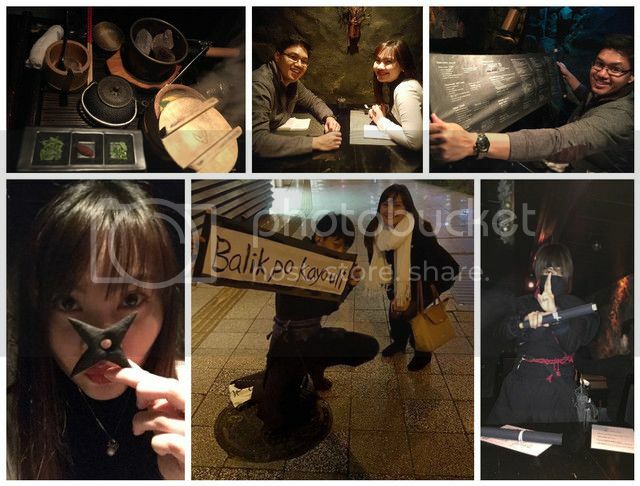 And finally, the highlight of our Tokyo trip (at least for me): The Ninja themed restaurant! 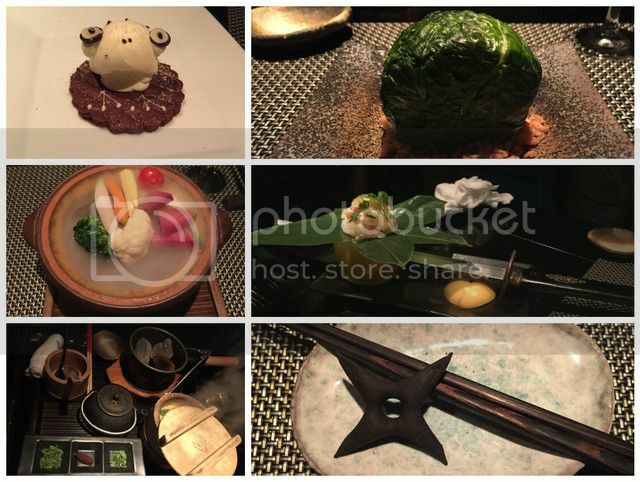 When I found out there was a ninja-themed restaurant in Tokyo, I immediately put that in our itinerary. I mean, it's my ninja dreams right there! How can I not?? EJ called the restaurant 2 days before to get us a reservation. The restaurant itself is a bit on the high end, but we wanted to do it anyway. The food were super interesting! They were shaped like weapons or had special effects in them. See the Katana piercing the grapefruit on the middle picture? When I pulled the Katana out, smoke came out! How cool is that?? Thank you Japan for the epic trip! It was a long, tiring, but memorable trip of a lifetime! 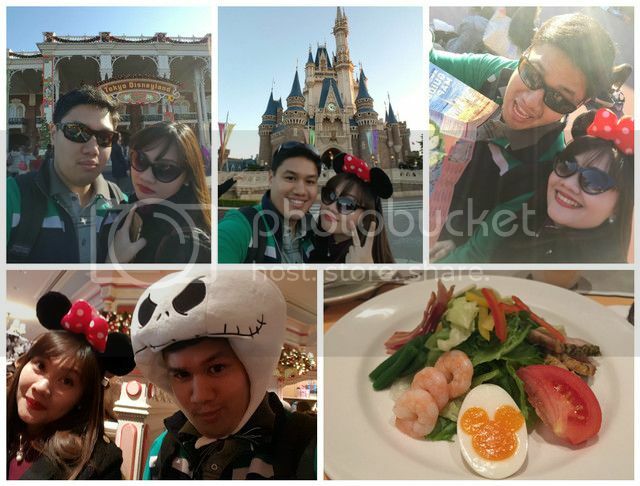 It's the first trip we took as a couple and we look forward to having more trips in the future! Thanks for sharing, and have a wonderful day hun!